Within most cultures, amazing recipes started as peasant food and out of need for sustenance and survival - especially dumplings! Pierogi are no exception, but they did quickly become a favorite among all classes in Poland, with more appeal as a festive food having different fillings for different occasions. These wonderful dumplings can be found in Central and Eastern European countries by various names, but we affectionately nickname them “delicious love nuggets”. They are made from unleavened dough wrapped around tasty filling and there are legends of where they came from – some say Marco Polo brought them over from Asia, some say aliens (no, not really -we think), but wherever they started, each culture added their own spin on the food. 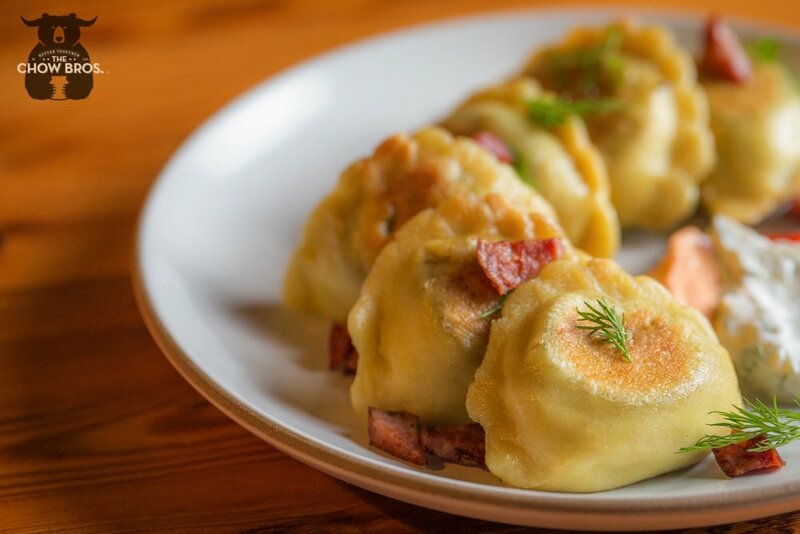 We grew up with the tradition of making pierogi and tip our hats to the generations of trail-blazing dumpling makers throughout the centuries-long history of this food. We now take that tradition and elevate it to the next level of flavor and excitement – welcome to The Chow Brothers modern takes on this classic food staple. Did you know Lactic Fermentation has been around for centuries, utilized by European and Asian cultures as a healthy way to preserve food longer and prevent certain illnesses like scurvy? With veggies, the process preserves more of their vitamins (B & C) and minerals while providing good microbes for better digestion (probiotics). Lactic Fermentation is a natural process which leverages lactic-acid forming bacteria present in almost all veggies and fruits. Once you add a bit of salt and moisture to the party to help the bacteria get to their happy place, sugars get broken down into two new players -lactic acid and carbon dioxide. The CO2 bubbles off (creating the fizzing you see) and the lactic acid gets to work creating that special flavor bomb for your enjoyment. With no preservatives added, the natural salt keeps the food from spoiling in the “wrong” way and lasting for long-term enjoyment.